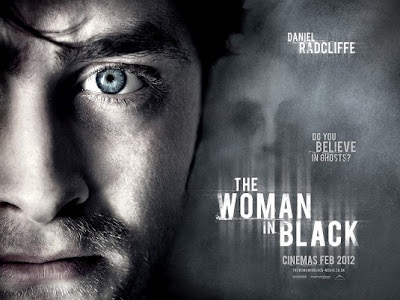 Yesterday, a group of my friends and I went to see "The Woman in Black" in the cinema. Firstly, I would like to express my dismay at the extortionate prices that multiplex cinemas seem to be charging nowadays! Now that we are above the age of 14, we have to pay adult peak prices for tickets, which turned out to be £7.95 each. The price for concessions is slightly less at £5.75, but apparently, that is only for children under 14, OAPs and students - which we don't count as being, since we aren't university students (ridiculous!). I have decided that being 15-17 is a terrible age as you still don't officially count as an adult, even though you have to pay the ludicrous prices, as some of my other friends and I once found out when we attempted to buy a family ticket instead. The price of popcorn and other confectionery is just as preposterous - £2.50 for a scoop of ice cream my arse. Anyway, for the actual movie itself, it was okay. I really detest Daniel Radcliffe - he's like a middle aged man trapped in a teenager's body - but I suppose he was bearable in the film, even though it wasn't a particularly taxing role to play, since all he had to do was creep around the house looking anxious. The film seemed to be mostly filled with lots of scares and things that would make you jump, instead of having the story line as the main focus. My friend who went to see the theater production said that the story line was particularly chilling, especially the ending, but this wasn't the case in the movie. Instead, the most prominent feature of the movie was the use of camera trickery to create all the scares, which was enhanced by the horrible, suspense-building background music. I would be lying if I didn't say that it kinda freaked me out. There were so many scares which were so obviously coming, like when Harry Potter was looking into the room which had Lucy locked inside, or when that bird randomly flew across the screen and the dog barked. They are the types of scares that would make you jump as they would build up by slowly increasing tension, which was suddenly broken by a loud noise, but, they aren't actually that creepy. However, I think the most chilling things are when you half see the actual woman who is haunting the house, such as when you saw her blurred in the rocking chair, or behind the spinney thing. Her scream is also horrible, but apparently in the theater production, it is so much more ear-wrenchingly loud and blood-curdlingly piercing. I really want to see it in the theater! One attempted to look at her phone to distract herself from what was going on onscreen. So yeah, it was all in all a good movie! They attempted to make a "happy" ending, which sort of worked, I suppose. I recommend you to go watch it, just not by yourself! I want to see it again too, simply so I can watch all the scenes that I missed. P.S. Today is the start of BEDIHT - Blog Every Day In Half Term. Huzzah. I'm not really sure what I am going to write about, but it shall be fun. Click follow on Google Friend Connect for a new post everyday. I watched it in the theatre!! ^-^ It was SOOOOO good and I got nightmares for ages :') I think I'm watching it in the cinema on Tuesday.